Here is an article that I wrote years ago about trans fats. They are still around because The FDA agreed in May 2018 to give companies one more year to find another ingredient for enhancing product flavors or grease industrial baking pans. Also, while new products can no longer be made with trans fats, they will give foods already on the shelves some time to cycle out of the market. How in the world did we come to this? In our modern American society, we have become reliant on fast, cheap food. I’m sure all of you know in some way or another that trans fats are bad for you. But do you know why? Let’s first look at the history of trans fats. Trans fats or partially hydrogenated oil is a man-made substance that was introduced around the first part of the 20th century. It is a preservative that keeps food fresher longer and gives foods a more tempting texture and taste. And what famous “food” heralded this new and exciting additive? Well none other than Crisco. 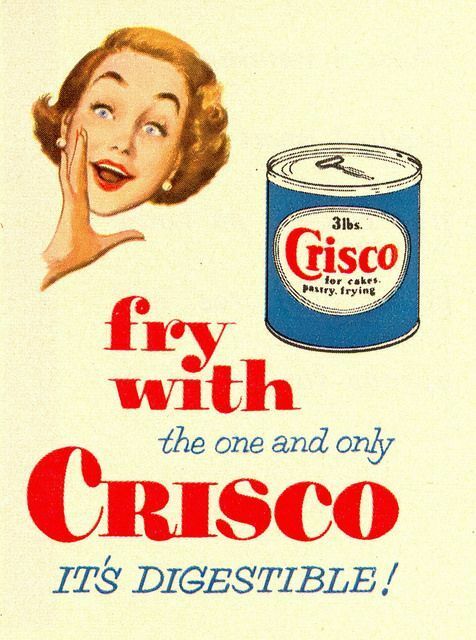 Yes, Crisco. That white, waxy-like substance that is still on our grocery store shelves today. Eventually trans fats moved to margarine in the 1940s and eventually moved on to other foods that have a long shelf life. Cookies, crackers and potato chips are just a few examples. In the 1980s, health advocacy groups were in an uproar over the saturated fat content in fast food meals. So what did the fast food industry do to quell the criticism? They switched to partially hydrogenated oils instead of beef tallow and tropical fats that were high in saturated fat. So in essence, fast food was actually healthier for you before 1984. You are probably asking yourself, what is all the uproar about trans fats? Why are they so bad for me? As you probably know, you have good cholesterol (HDL) and bad cholesterol (LDL). When you have blood drawn, you want a higher percentage of HDL cholesterol than LDL cholesterol. A high level of LDL cholesterol is the precursor for strokes, heart attacks and heart disease. HDL cholesterol actually helps sweep out the bad cholesterol in your body and is an antioxidant. A number of foods affect this ratio. If you are eating good fats (polyunsaturated and monosaturated) found in such foods as olive oil, avocados or nuts then you can actually increase your HDL cholesterol and lower your LDL cholesterol. If you are eating foods high in saturated fat such as fatty meats, whole milk or ice cream, then your LDL cholesterol increases but your HDL is not affected. And here is where trans fats come in. When you consume that bag of Oreos, the trans fats are going to LOWER your HDL cholesterol and raise your LDL cholesterol! That is why they are a horrible additive to our food supply. But as the science came out about trans fats, lawmakers and the health advocacy groups started noticing. And they have taken action to do something about it. In 2002, the U.S. Food and Drug Administration passed regulations requiring food processors to start labeling trans fats on the nutrition labels of food. This was a great step forward. However, there is a catch. So it is possible to still be consuming trans fats, lowering your HDL cholesterol, raising your LDL cholesterol, hardening your arteries and making yourself more susceptible to heart disease because the food industry can claim there is zero trans fat in their foods. Read the ingredients in the label. If you see any type of oil that is “partially hydrogenated” in the ingredients, it has trans fats even if the packaging states it has zero trans fats. And local governments are also putting the food industry on notice. New York City was the first city to ban trans fats in any food served in restaurants. California followed suit soon after as well as other states and cities. You can become more educated about your food choices and you can become healthier just by making the right food choices. It’s time that we start demanding healthier food choices from the food industry and taking the initiative to consume healthier foods.